The soil is a complex medium in perpetual evolution that has developed from the slow decay of parent rock. The erosion of parent rock gives the soil its physical consolidation through pebbles, gravels, sand, silts and clay in its late stage. However, were soil only made of these mineral components, it would be of little use to man for it would be sterile. What makes it fertile and gives its capacity to develop plant life, is the very close association of its mineral compounds with humus, another original constituent of the soil. Humus or “stable” organic matter is mainly formed by the biochemical transformation of plant debris under the action of macro-organisms (worms, acari, collembola …) and telluric microorganisms (fungi and bacteria). One of the representative “constructions” of the synergy between organic matter and soil mineral elements is the Clay-Humus Complex (C.H.C). This electrostatic entity, stabilized by cations, is a true reservoir of nutrients for the plant, in dynamic balance with the soil solution and determines its Cation Exchange Capacity (C.E.C.). – lessening ferric chlorosis risks in calcareous medium, while preserving iron from insolubilisation by carbonates. – lessening risks of ion phosphate retrogradation in acidic medium (insolubilisation by aluminium and iron). 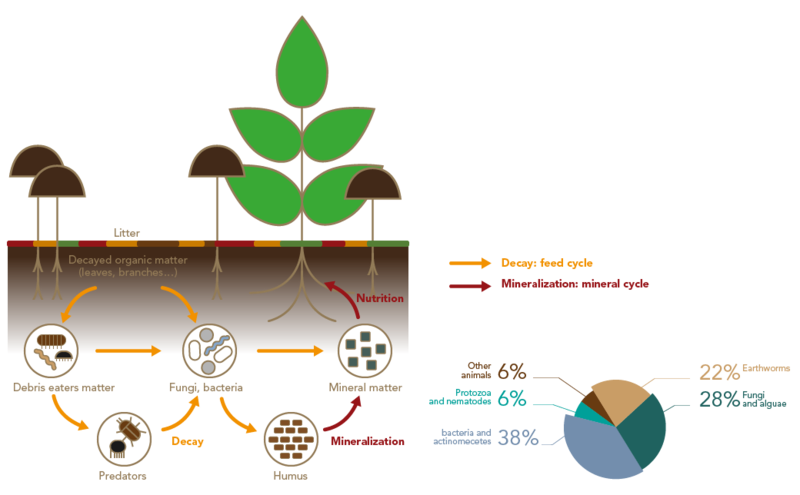 Humus plays a major role in soil fertility. A true architect to soil construction, it stabilizes its structure, promotes air and water circulation, influences water holding capacity. Associated with clay to form the clay-humic complex, humus constitutes an essential nutrient reserve for plants. A true power generator of soil life, it promotes an active and diversified biological life. In order to preserve soils from impoverishment, it is necessary to compensate for losses in nutrients caused by previous crops or by rainfall. The objective of organic fertilization is to approach the best yield, the best quality while preserving the environment by economically acceptable ways. At the core of soil issues and closely linked to its organic condition stands out the biological quality of soils. It is the key element of their proper working and fertility, as Rémy CHAUSSOD, Research Director at INRA, points out: «One cannot imagine achieving sustainable agriculture without trying to preserve soils quality. Biological parameters, interacting with physical and physico-chemical properties, are very much involved in the overall quality of the soil “. An extreme variety of organisms of all sizes live in the surface “organic” horizon of a temperate meadow land. They participate in the decay of organic matter into humus and then in its mineralization. 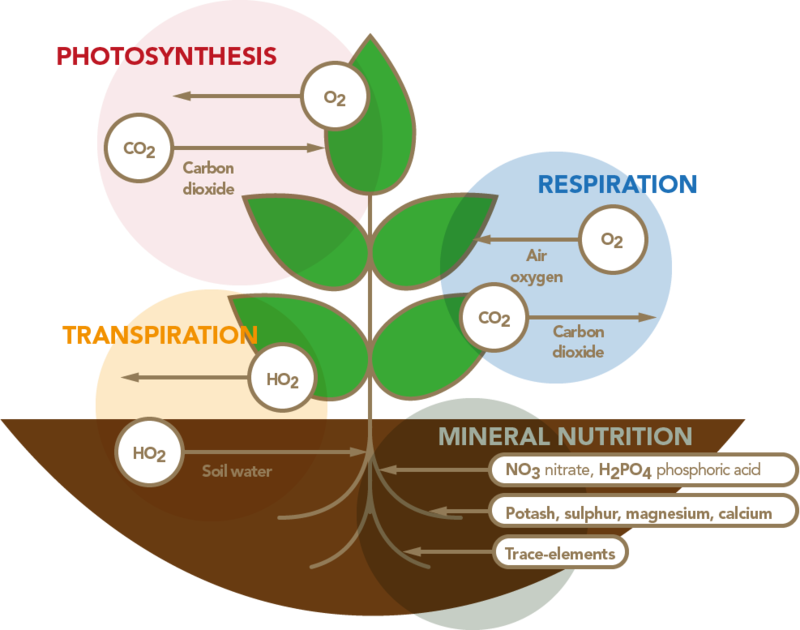 The mineral elements thus produced contribute to feeding plants. How to opt depending on the agronomic needs of the plant and/or soil ? Their role is multiple and ranges from the improvement of the biological properties of the soil, from the rhizosphere to the nutrition of the plant. Amendments, as the name indicates, are soil quality promoters VÉGÉTHUMUS, VÉGÉVERT. The supply of digestible carbon in the soil will act on the physical, chemical and biological properties and thus provide safe guarantee to plant crops. They act on the carbon cycle (carbon storage in soils) and on biological activation (functional biodiversity). 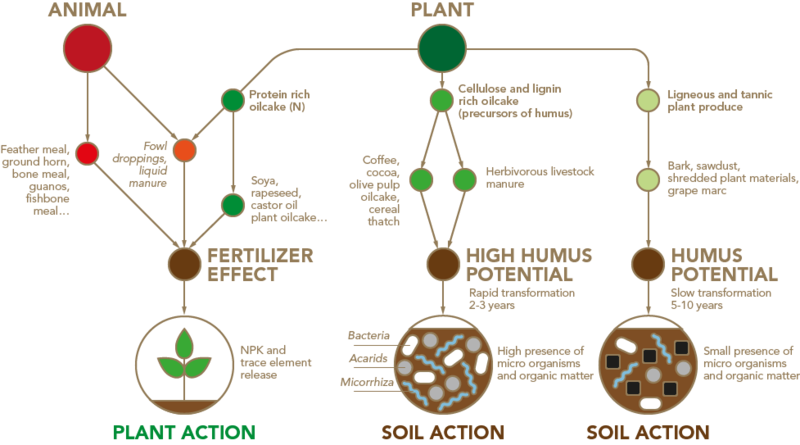 Fertilizers have a targeted action on plant nutrition, notion of “fertilization/fattening”. They can be organic such as ORGA 3, EVER, or organo-minerals such as ACTIMUS or TÉNOR 5 5 10. Frayssinet formulations combine both soil action (composted organic base) and nutritive action for the plant. The concentrated organic and / or mineral supplements they contain will ensure a balanced and continuous feed of plants. The technical quality of our formulations is a major element in nutritional performance. The recommendation of plant natural stimulators is a safe response to professionals but also to the end user. The new environmental requirements for the reduction of the active matter dose of plant protection products and the improvement of the efficiency of nitrogenous fertilizers are orienting us towards a new generation of natural products. In this new category of stimulators, OSIRYL certified root growth stimulator is a reliable response, designed to optimize nutrition and crop quality, but also to improve root resistance under stress conditions. The synergistic effects of OSIRYL actions with the organic fertilization programs and Frayssinet foliar supplements is in line with this objective to improve the effectiveness of fertilizers and the resistance of crops for a better environmental protection. The use of liquid antioxidant and biostimulant products is justified by the quest for alternative solutions providing more natural plant treatments which can cope with metabolic dysfunctions at various major phenological stages (restart of photosynthesis, flowering, maturation, preservation). These foliar or soil applications with nutritional supplements thus improve the resistance and self-defense of plants in stress conditions. Among these products, the choice of ANTYS lies in the protection of the photosynthetic metabolism and the associated complementary nutrition. Regarding the NUTRIBIO range, it is the synergy between an adapted nutritive organic supply and the integrated action of the certified root stimulator. The ANTYS product range are combined with the Frayssinet organic fertilization programs and OSIRYL applications in order to optimize the nutrition and natural resistance of plants, with the aim of a reliable and safe environmental response.